Email forwarding generally refers to the operation of re-sending the email message delivered to one email address to probably a complete different email addresses. The term forwarding do not have any specific technical meaning. However it implies that the e-mail has been forward to a brand new destination. Forwarding of email accounts permit you to automatically redirect incoming messages to a different email address. There's no inbox for a forwarding account, and nothing will be stored. Redirecting of any email messages sent to your forwarding account address to the different email address which you specify. 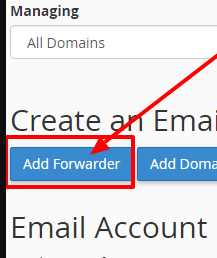 cPanel web hosting provider will permit you to create two types of email forwarders like Email Account Forwarders and Domain Forwarders.Email Account Forwarders are assigned as one of the forwarder per email account. You will be able to create multiple forwarders, but you have to do them individually. 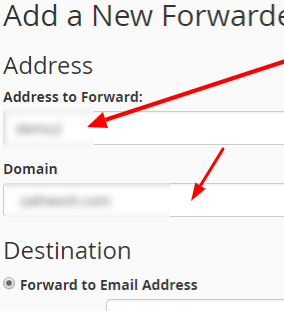 ==>Type the username of the email address in the Address to forward. ==>Choose the domain from the drop box the user name is for. 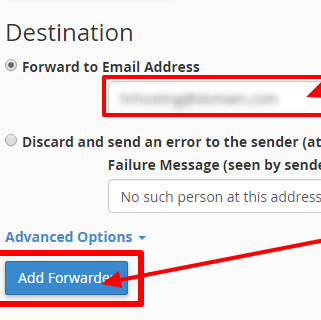 Step-5: Type the full email address that you require to forwarder emails to the text box and click Add forwarder.